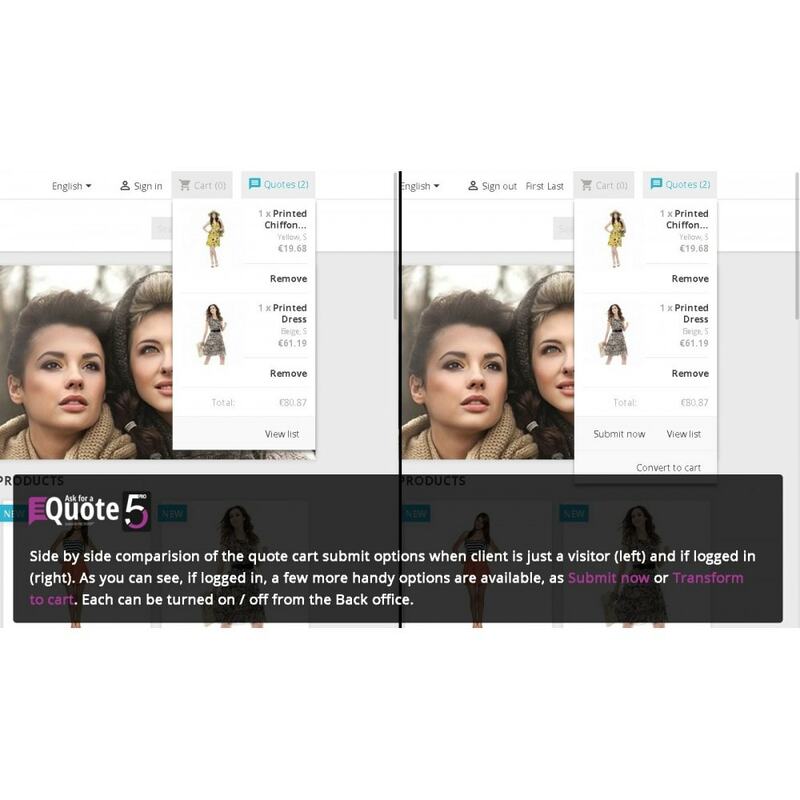 We can really admit in this case, that the good got even better, and all this based on Your feedback and requests: this is the enhanced pro version of Ask for a Quote module for Prestashop! 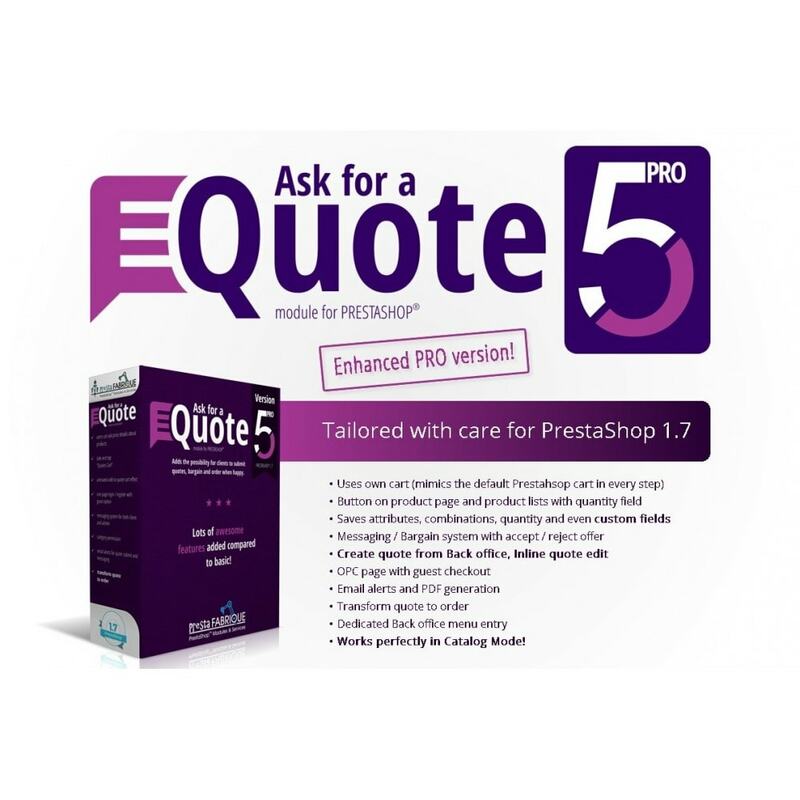 During the several years existence of Ask for a Quote, clients have requested from us a lot of interesting and unique features as an after sales service, and we decided to bundle the best and more useful ones into a more enhanced and feature rich version of our module called Ask for a Quote PRO for Prestashop, resulting in a nice and feature rich product, worth of an upgrade! NEW: transform Abandoned cart to Quote! But what exactly this module does? If you are here first, and did not seen our basic version yet, here's the presentation. For the PLUS features this offers, see below at Features section. Wholesales, B2B type shops, niche webshops or market style e-businesses cannot always or do not want to allow direct purchases, or simply for some reason is not possible to display a price and a buy now button. Or, simply for the biggest customer satisfaction, just want to grant them the possibility to bargain or obtain more info about group of products. transform abandoned cart to quote! Our module works perfectly in catalog mode – even more, it’s an almost compulsory plug-in if this is enabled in Prestashop, but again underline: catalog mode is not mandatory for the module to work! If Prestashop is in normal selling mode, the module gets along completely with the default shopping cart, and you can even customize it to appear only in selected categories or next to the products which can’t be ordered on-line. Don’t forget: successful bargaining is one of the foundations of good business; it ensures that both parties are content, and a happy customer can easily turn into a returning customer! 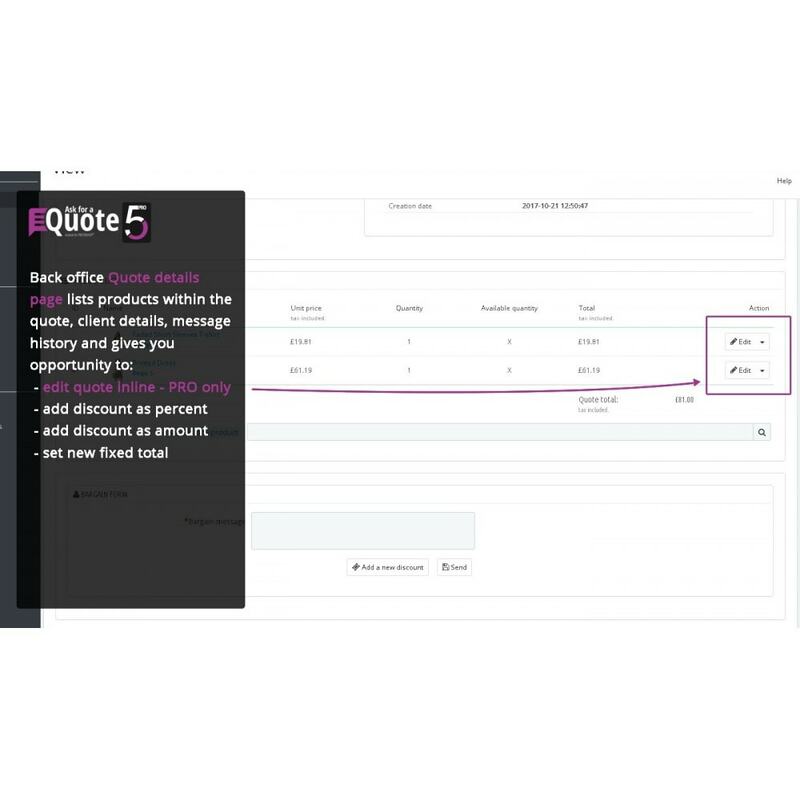 Similarly to the buying process, the customer places the products they are interested in into a virtual quote cart, and after filling out some text fields, asks the owner of the store for a quote. If sending is successful, both of them receive a notification, and a built-in messaging system also allows them to chat and to haggle. If both parties are content with the offer, the owner freezes the bargaining, which is transformed into an order, and the discount is deducted automatically as well. if they accept the offer, the quote can be transformed into an order and the discount is automatically deducted as well !!! * customisation detection - module will detect customizable fields for products, even in catalog mode! 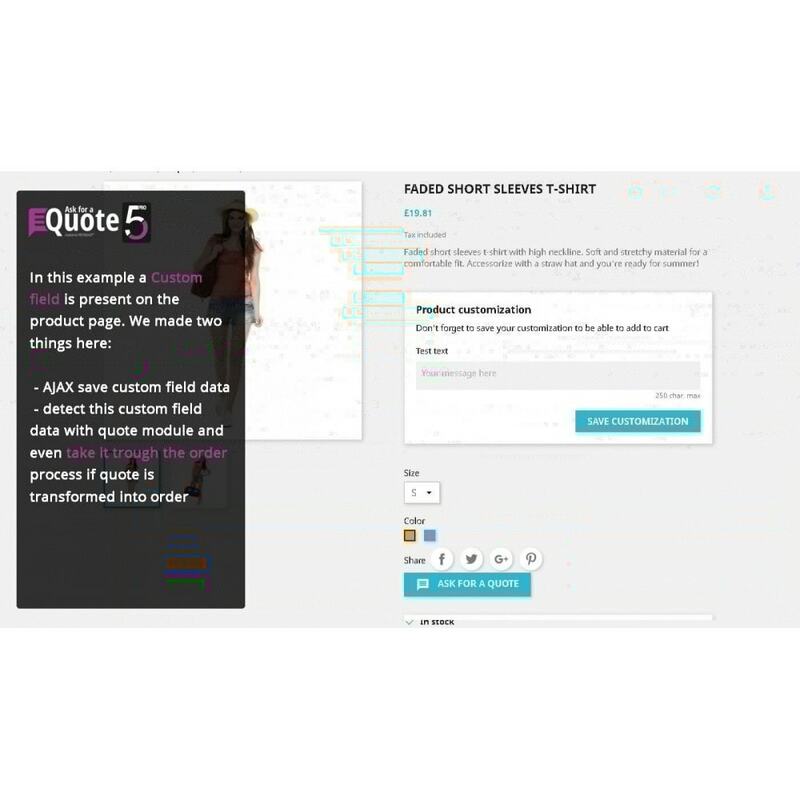 transform Abandoned cart to quote - maximize conversion rates! * version 5 for Prestashop 1.7 only! The most advanced responsive mega menu Prestashop module. By using Drag&Drop builder you can easily create horizontal or/and vertical dropdown navigation, and responsive mobile menu. This module will help you to make your shop more interactive and will keep your visitors abreast of the latest news, events, products... It will fit perfectly to your store, whether multilingual or not! Does it work in Catalog mode? 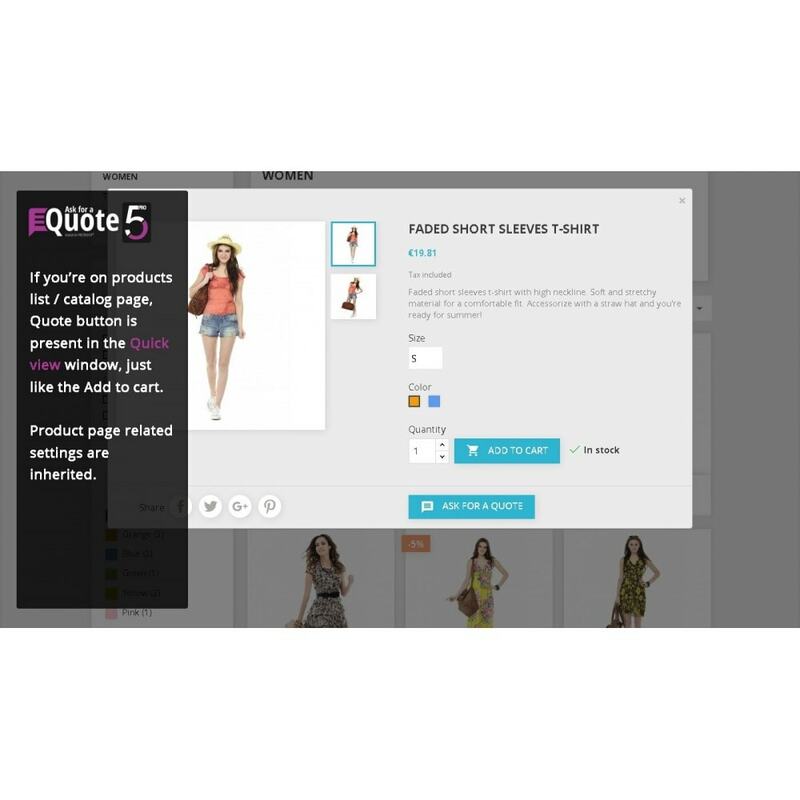 Yes, our module works perfectly in catalog mode, but please note that in catalog mode, all order related features are turned off by Prestashop, so the „transform a quote to order” functionality will not be available. No, catalog mode is not mandatory. Module works in both cases perfectly! May I try it before I buy it? You cannot install it on your localhost or test server, but there is a demo website set up just for this purpose, accessible directly from the sales page of the module, from where you can access both front and back office. Be free to test all functionality . Anyway, since you are reading this, we presume you already purchased it! Can i run this on more than one website? Short answer is no. When you download the module, you must enter the URL of the Prestashop install where you intend to use the product. Of course, our module does not have any tracer of spy script, so it will install and work on other websites, but please note, that you will loose all your support and refund rights in this case. If you want to buy 5 or more licenses, please contact us and we can discuss about a discount! Is the module compatible with my theme? Hard to say. If your theme is derived from the default Prestashop theme, and has not been altered or edited too deeply, than it will work for sure as it inherits the basic Prestashop classes and formattings. However, if your theme was built from scratch, and it’s missing some core Prestashop hooks, fonts and scripts, than it might broke or look bad and must be adapted to your theme. If this is the case, please contact us and we will guide and help you! Is it safe to upgrade the module? 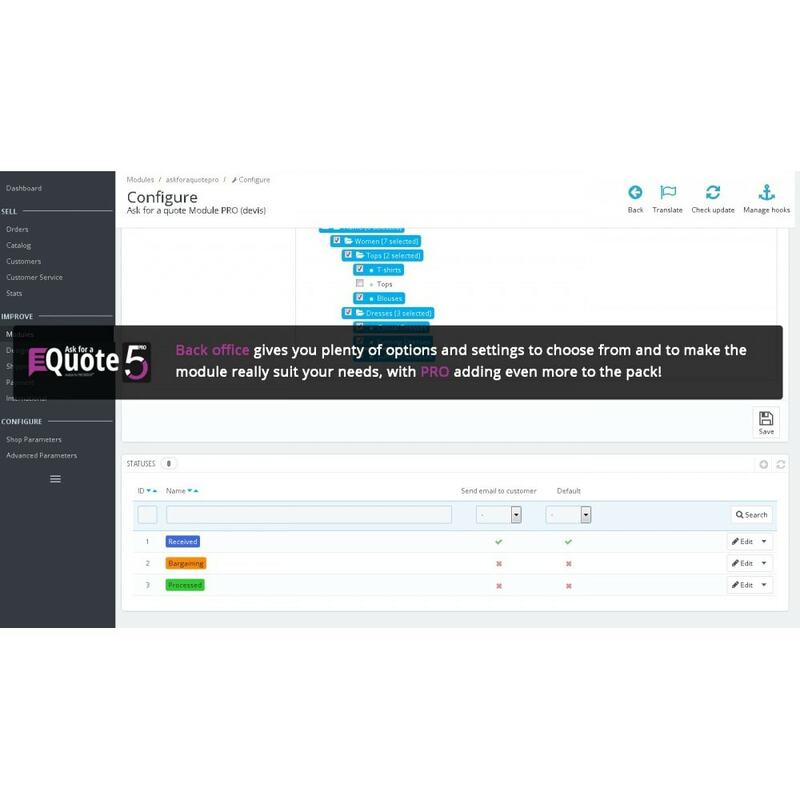 From the submitted quotes point of view: yes it is, as we provide an upgrade script for each new version. Best is to connect to your Addons account directly from your Back office, and you will be notified when a new version is out. From the applied changes and edits point of view: if they were done right, than yes. This means, that all changes and customisations should be done with file overrides in your theme directory, instead of direct original file editing, as these gets overwritten in the upgrade process. Upgrading from basic to PRO helds some risks and if the case, you should contact us first! Does the module work with products out of stock? Yes it does. Ask for a Quote don't cares about the stock of products, because no actual order is taking place. However, the transform a quote to order feature might brake if the products or not available, but this is also due to the shop owner, since if he accepted / offered a reduction, he/she should have the stock ready for order. Does the module work if price is zero? Yes it does. Of course, if the case, you should hide zero prices, because clients could feel uncomfortable to receive a much higher offer from the owner for a product that had zero as price. If you need help with this, you can contact us after purchase and we can implement this for you upon agreement. Is it possible to allow some goods to be sold online and for other, the customer must ask for a quote to receive prices? Yes. The module allows the button to appear only in the case of products that are not available for order. On the customize page, you must activate this option (filter by product status), and for any product for which you want to enable this feature, in your Back office, on it's edit page, you must uncheck the "Available for order" option. Your clients, if they want to buy a bigger lot or ask for a better price, have the possibility to ask details about certain products, bargain with a built-in messaging system, and agree on offer, which than can be transformed into an order. You can take the module as an actual between / complementary step in the order procedure as the process is very similar to the normal "Add to cart - Submit order" one. They can bargain a price for their chosen products, and this increases the chances of purchase, since the final price was suggested and agreed by them too! And the biggest functionality of all: transform abandoned carts to quotes, and give clients a discount on their favorite products! The module was tested with an unmodified version of PrestaShop 1.7 and on the default theme. If you encounter issues, please contact us and we will debug and adapt to your theme if needed. We are trusted sellers here with Superhero status, so you can trust us and don't hesitate to contact us! Version 4 works only under Prestashop 1.6. This PRO version is NOT working side by side with basic version, and latter must be uninstalled first! Login to your Back Office if you have not already done so. Go to the Modules tab. Select the file which you downloaded from Prestashop Addons or our website. It should be called "askforaquote.zip". Click the "Upload this module" button. 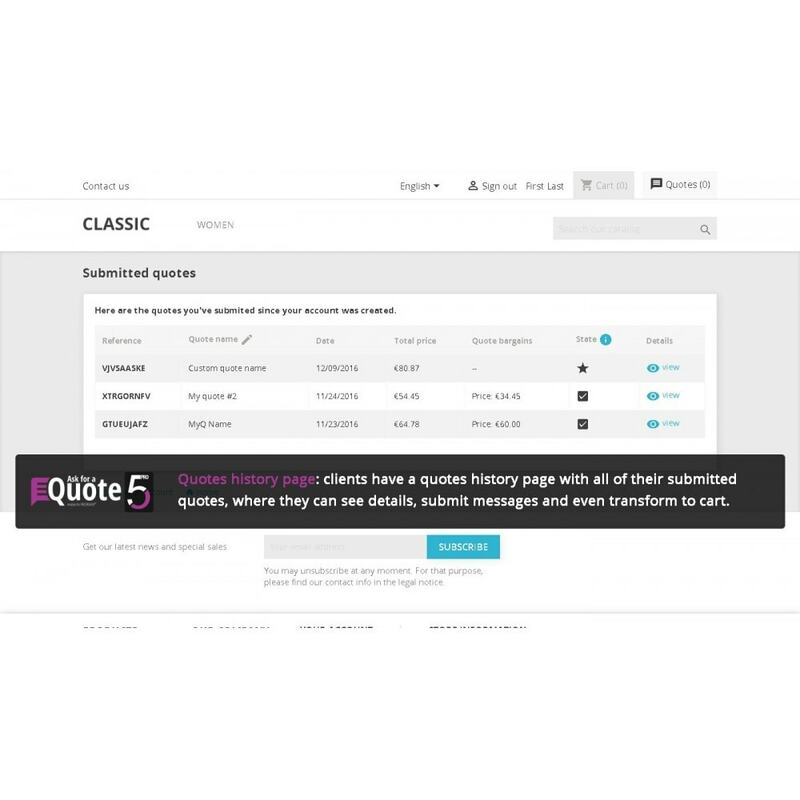 You should see the "Ask for a Quote" module in the list of modules. Click the "Install" button next to this module to install the module. Configure it to your needs.